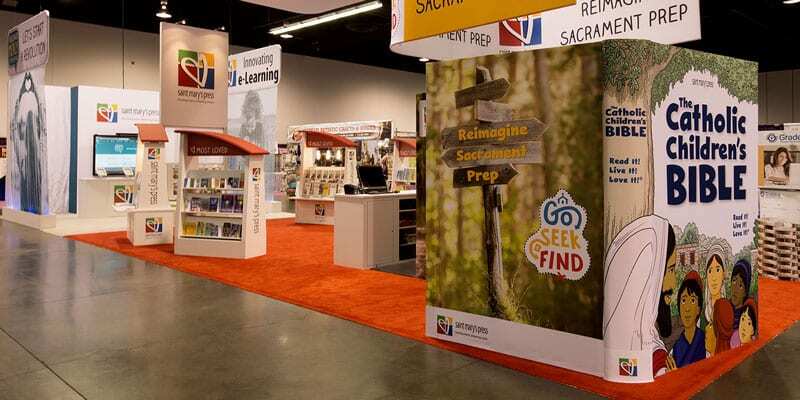 St. Mary’s Press, a leading publisher of Catholic children’s literature, sought to wow its visitors by artfully displaying its books on the trade show floor in a creative and educational way. St. Mary’s Press partnered with Nimlok Minnesota, who designed a large-scale 20’ x 60’ exhibit that impressed and engaged visitors through tasteful and creative product displays. Custom-built bookshelves helped St. Mary’s Press showcase its full-line of Catholic children’s Bibles and literature, while a larger-than-life replica of their signature children’s Bible sat prominently in the foreground of the exhibit. The replica children’s Bible was designed with turnable pages, allowing attendees to engage physically with the product display and helping further invoke excitement and inspiration among visitors. The large children’s Bible was so successful at engaging visitors that St. Mary’s Press made plans to use the structure in all face-to-face events moving forward. Unique product displays helped St. Mary’s Press wow and engage audiences and sell its products in a memorable and creative way.